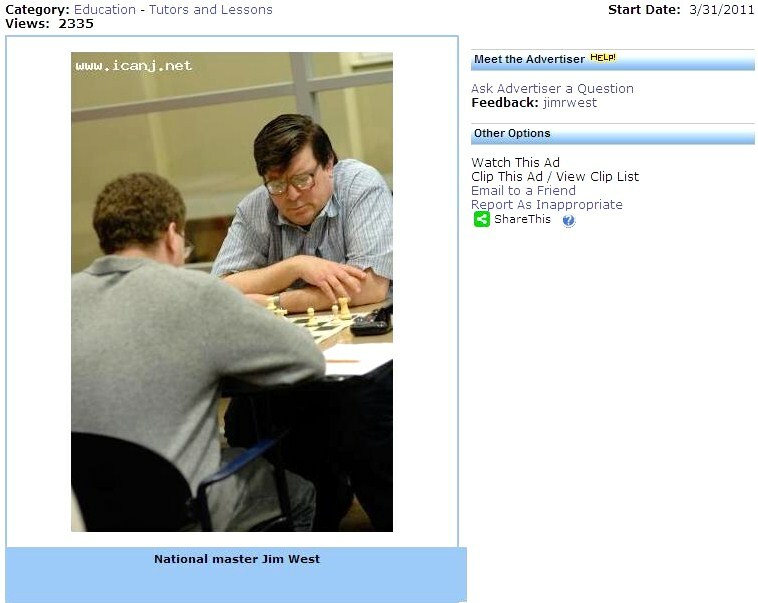 The Marshall Chess Club presents its new international master in residence Jay Bonin. 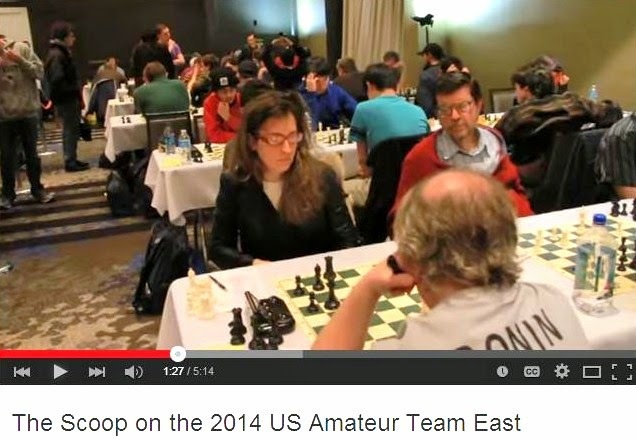 International master Jay Bonin is one of the great legends of American chess. 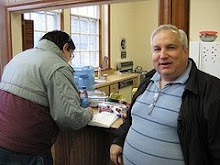 Having played and won literally several hundred games a year for decades, he is a permanent fixture in the New York chess scene and the most active player of any level in the country. 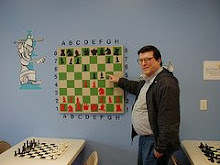 Beginning March 1st, all Marshall Chess Club members will be able to profit from Jay's unmatched experience and top level skills as he is available to analyze games every Thursday from 4pm to 7pm. Whether you are looking to perfect your opening or trying to find the best strategic plan in the middle game, just bring the score of your recent tournament or casual game and Jay will analyze it with you. 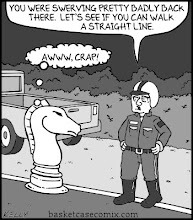 We offer this service free of charge to Marshall Chess Club members. Non-members are welcome to attend for a $10 charge. 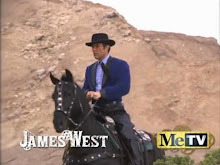 Every Thursday from 4pm to 7pm, beginning March 1, 2012. 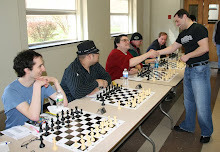 These are photos from the USATE 2012, courtesy of Atlantic Chess News editor Steve Ferrero who was also my teammate. On Sunday, I won this game in a game/30 Swiss at Chess Mates. 38.h4 e4 39.Nd4+ Ke5 40.Nc2 Nf6 41.g5 hxg5 42.hxg5 Nh7 43.Nb4 f3 44.Nd5 f2 45.Ne3 Kf4 46.Kd4 Nxg5 47.Nf1 Ne6+ 48.Kd5 Nxc5 49.Kxc5 e3 50.Kd4 e2 51.Ne3 f1=Q 52.Nd5+ Kg3 53.Nxc7 Qf4+ 54.Kc5 Qxc7, White resigns. 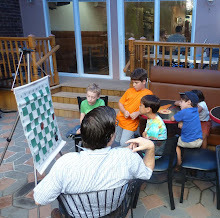 On Saturdays, I teach a 4-hour camp from 9am to 1pm at Chess Mates in Rahway. At 1:30pm, I play in the game/45 Swiss. Please note: now you can park your car for free in the lot across the street from the club! These are my games from yesterday. 15.Bxh6 gxh6 16.Qxh6 Nh7 17.Ng5 Nxg5 18.Qxg5+ Kh7 19.d5 exd5 20.Ra4 Bxa4 21.Nxd5 Bf4 22.Qh4+ Bh6 23.Nxc7 Rac8 24.Qe4+ Kh8 25.bxa4, Black resigns. 38.Rhe1 Bg4+ 39.Kg3 Bxd1 40.Re4 Qd5 41.Rh4+ Kg8 42.Re3 Rf3+ 43.Rxf3 Qxf3+ 44.Kh2 Qf2+ 45.Kh1 Bf3#. 15.g4 h6 16.h4 b4 17.g5 bxc3 18.gxf6 Bxf6 19.bxc3 Bb7 20.c4 Bxh4, draw. 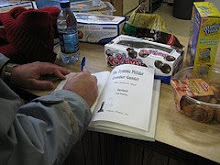 Look at these pictures, taken by me on Presidents' Day during the USATE. 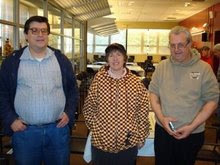 The team of IM Dean Ippolito, NM Jim West, Steve Hrop, and Steve Ferrero [pictured, right to left] called ourselves Occupy Parsippany - We Ain't Leaving at the USATE 2012. But a better name might have been Occupy New Jersey - We Ain't Losing. When we learned that our New Jersey state prize had been awarded in error to a team with a New York state resident on it, we raised Cain and got back our New Jersey state prize. 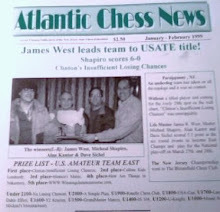 The awarding of the New Jersey state prize at the USATE 2012 has been revised from my team Occupy Parsippany - We Ain't Leaving to Caro-Cain Defense: 999 Plans to Mate who also finished with 5 points. According to the story by Al Lawrence at Chess Life Online, WGM Rusudan Goletiani [pictured] was on team Caro-Cain Defense: 999 Plans to Mate. But when you check Goletiani's ratings page at the USCF website, her membership is shown as being from New York. How can they be the top New Jersey team? These photos were snapped by me on Sunday at the USATE. 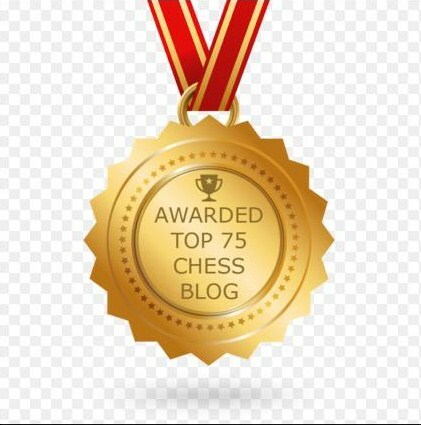 Rewind of Magnus Carlsen on "60 Minutes"
Bobby Fischer on "60 Minutes"
Magnus Carlsen on "60 Minutes"
Book Review: "Searching for Bobby Fischer"
World Premiere of "Brooklyn Castle"
Saturday Camp at "Chess Mates"